A NASA orbiter flying around Mars is showing evidence of an ancient underground-fed lake at the bottom of a crater, another sign that the planet may have once had life. 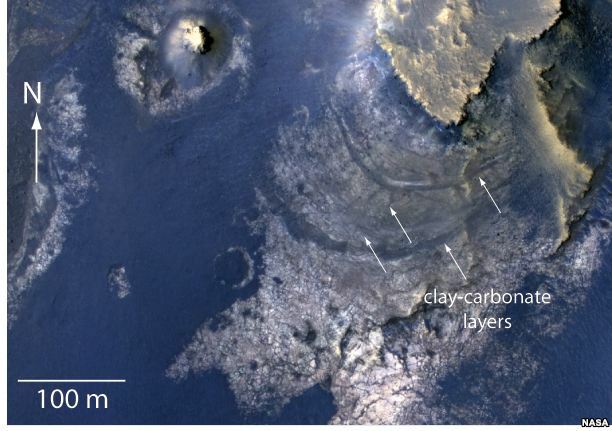 The Reconnaissance Orbiter spotted carbonate and clay materials inside what scientists have named McLaughlin’s Crater, a pit 92 kilometers wide and more than 2 kilometers deep. Such materials can only be formed when water is present. The scientists say the lack of channels inside the crater means the lake was likely fed from underground. NASA scientist Rick Zurek says the latest findings reveal a more complex Mars than previously thought, with some areas of the planet likely to show signs of ancient life more than others.